Front & Central restaurant in Wolfville, Nova Scotia is definitely the gem of the Annapolis valley, if not the entire damn province. Owner/chef Dave Smart (or Smarty Pants as I like to call him) is also a close friend of mine, which means that I get unfettered access to his sublime creations, and endless rounds of my beloved Bob Herman cocktail. (Try not to be too jealous) As well as being chef/owner of a much lauded restaurant, Chef Smart happens to be an engineer as well, which you can see reflected in the precise structure & balance of his food. No element is gratuitous, and all work together with a surprising delicacy that still somehow manages to remain totally approachable. Remove husks from 2 of the corncobs. Apply a small amount of oil to each cob and season with salt and pepper. Grill cobs on a very hot grill. Remove when the cobs have become grill marked and the kernels have softened. Allow the cobs to cool. Then, using a knife, carefully cut the kernels off the cobs. Reserve grilled corn for chowder. Using a knife, carefully cut the kernels from the cobs. Transfer the kernels to a blender and blend on high speed until broken down, adding small amounts of water if necessary to help purée the kernels. Remove from the blender and strain through a fine mesh strainer, pushing on the solids to extract the corn milk. Reserve corn milk for chowder. Heat BBQ grill on high. Place wood chips in a disposable pie pan and wet slightly with water. Place on hot grill to begin to smoke. This may take anywhere from 2-8 minutes. Carefully wash and sort mussels discarding the ones that are open or damaged. Place mussels in a large disposable lasagna pan and place on grill beside the now smoking wood chips. Close the lid of the BBQ and smoke for 5 minutes. Quickly lift the lid and give the mussels a stir. Close the lid and smoke for another 5 minutes. The mussels should have opened at this point. If not, smoke for an additional 2-3 minutes. Remove mussels from pan and reserve the cooking liquid straining through a fine mesh strainer to remove any grit from the mussels. In a large pot, heat oil and butter over medium heat. Add shallots, fennel, leek, and celery root. Sweat until softened, about 3-4 minutes. Add white wine, scraping up any bits that may have stuck to the bottom of the pan. Add diced potato, chicken stock, fish stock, heavy cream, corn milk, bay leaf, and thyme. Bring to a boil and reduce heat to low and simmer uncovered until potato and celery root are very soft, stirring occasionally. Remove pan from heat and remove bay leaf and thyme. Stir in lemon zest and reserved cooking liquid from the smoked mussels. Working in batches, transfer to a blender and purée until smooth. Season with salt and Tabasco sauce. Gently heat the chowder broth, grilled corn, and mussels over medium heat. 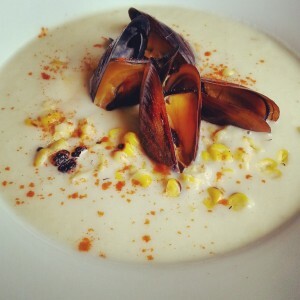 Ladle the chowder into the serving bowl, evenly distributing the corn and smoked mussels. Garnish with smoked paprika and a drizzle of extra virgin olive oil. Serves 8-10 and is worth noting that this dish can be served hot or cold.